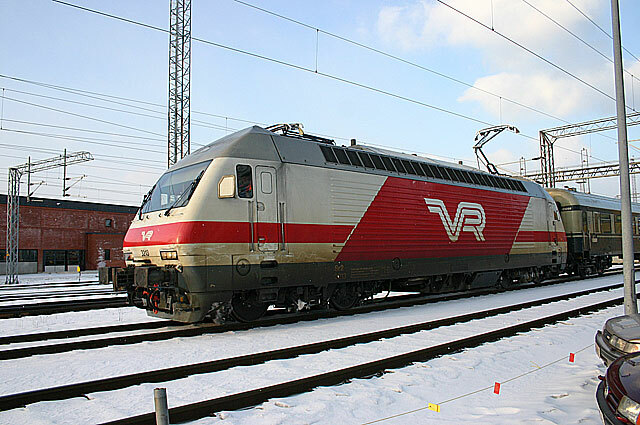 The VR is running like a fine clock work, the train are really on time on on just on the minute but allmost on the second. 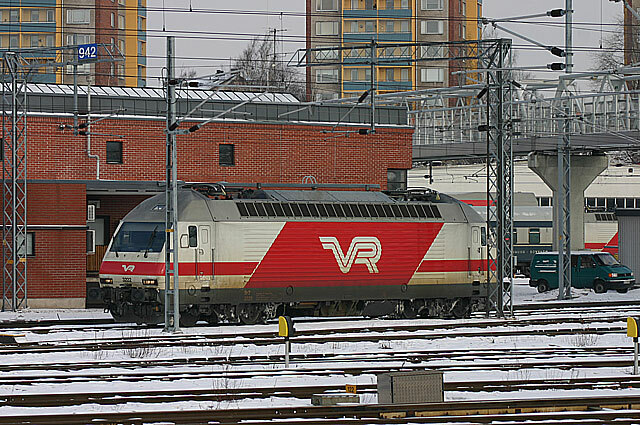 One example of this is this Intercity train from Kuopio arriving Turku 18th March 2005. 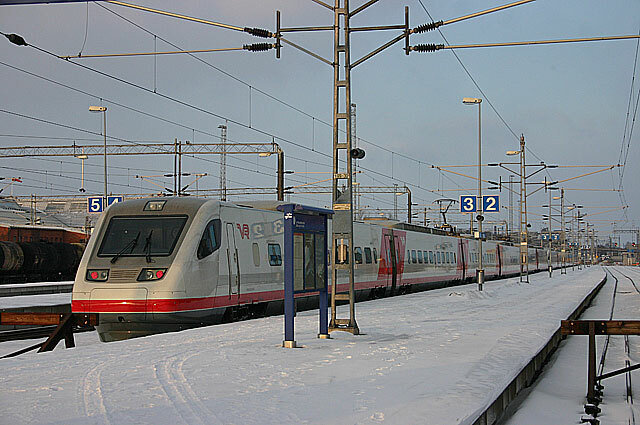 Note the rather mixed consist of first restaurant car in blue and grey, second generation IC cars and the latest doble deckers in this consist pulled by Sr1 3022. 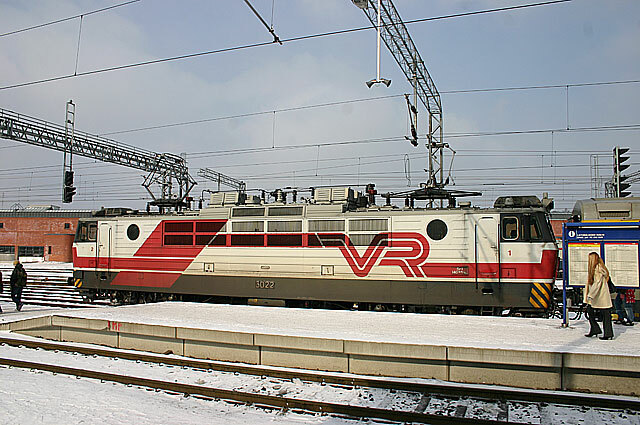 VR Sr1 3033 in Helsinki. 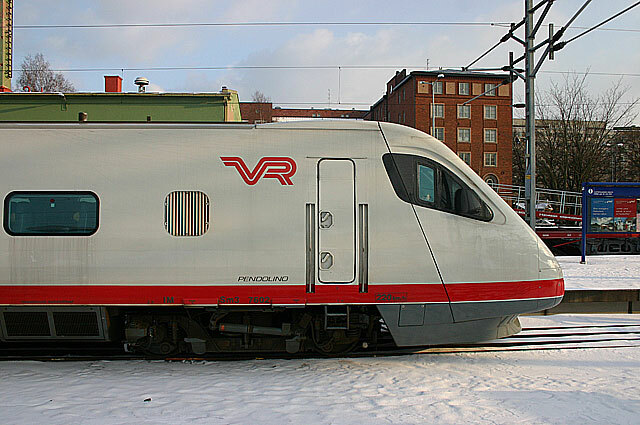 The first electrics in Finland are the russian built Sr 1.s. 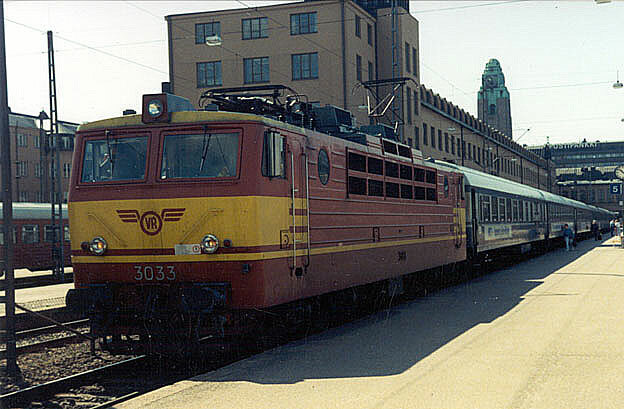 Here in circa 1985 a Sr1 in original colors of red and yellow is about to leave Helsinki Central Station with an express train to Tampere and beoynd. 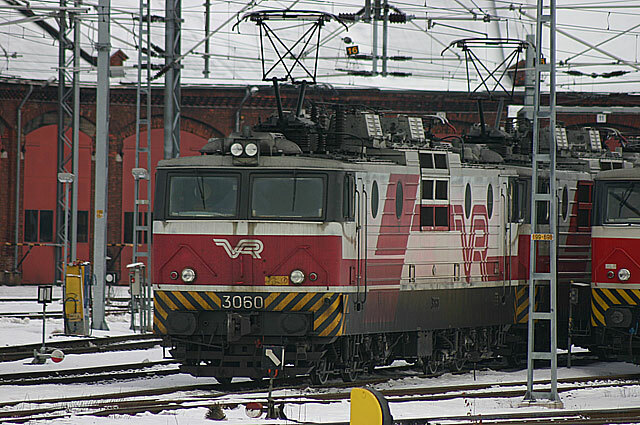 Sr1 3060 is enjoying a rest near the roundhouse in Turku in 18th March 2005. 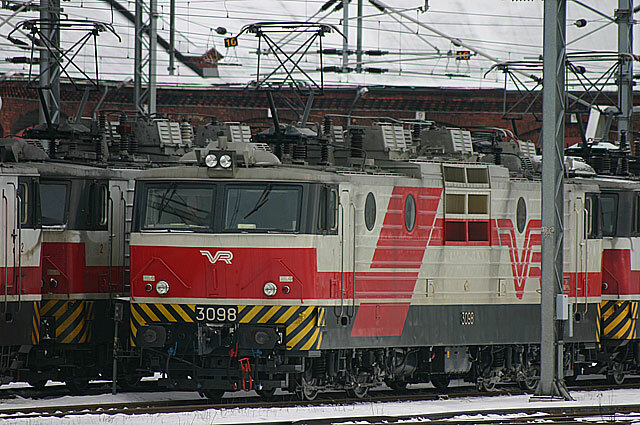 Note a different treatment of new white and orange scheme compared with Sr1 3098 seen below. From the days when I lived in Turku things are changed. 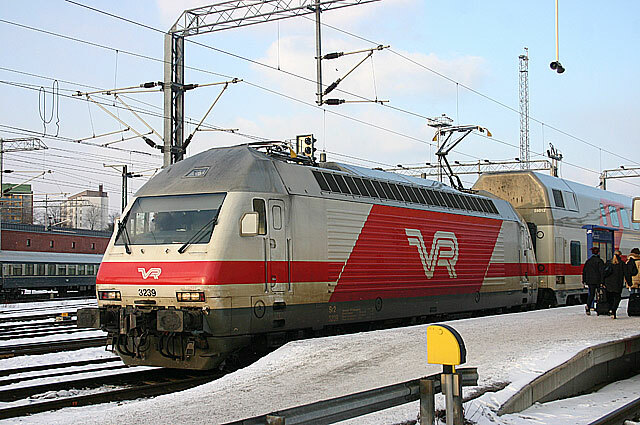 So is railroading, the electrified network has reached the city and there are new platforms and New power instead of red and cream diesels. 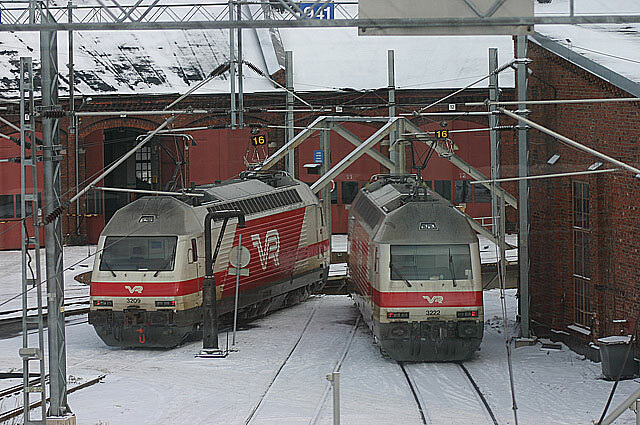 The yard and station is by far busier than before. Near the old sitll exixting roundhouse tracks Sr1 3098 is waiting for the call for the road service. 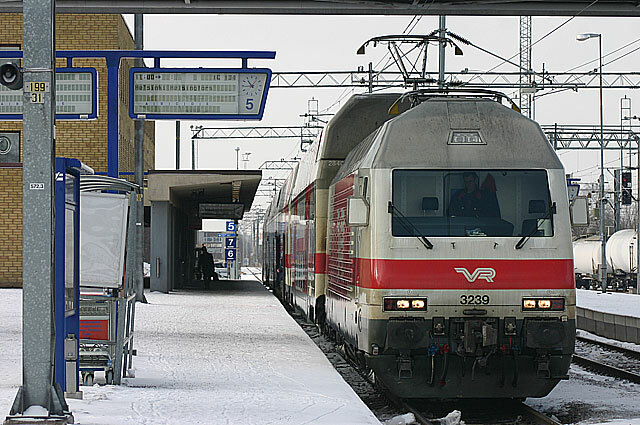 Turku 18th March 2005. 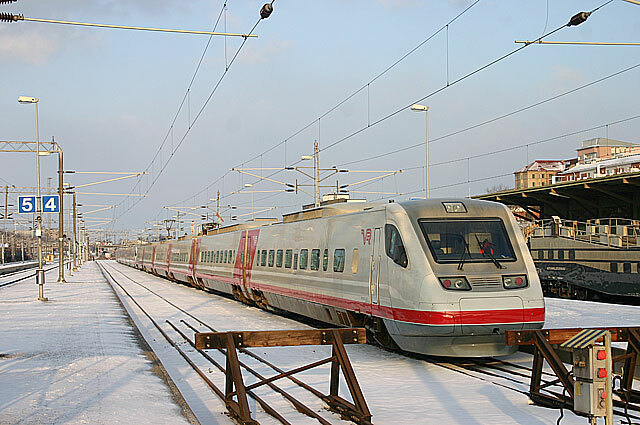 The second generation of electrics are the Swiss built Sr2.s. 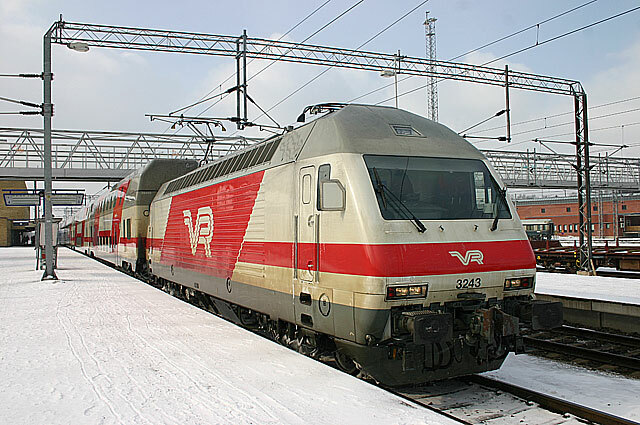 These are more or less broad gauged copies of SBB 460.s and near twin sisters are also used by Norwegian State RR (NSB) as EL18-class (See more in NSB electrics section) In Turku I saw a plenty of these 210km/h fast and 8000hp.ed units hauling every IC-trains towards Helsinki together with the rather new Pendolinos. 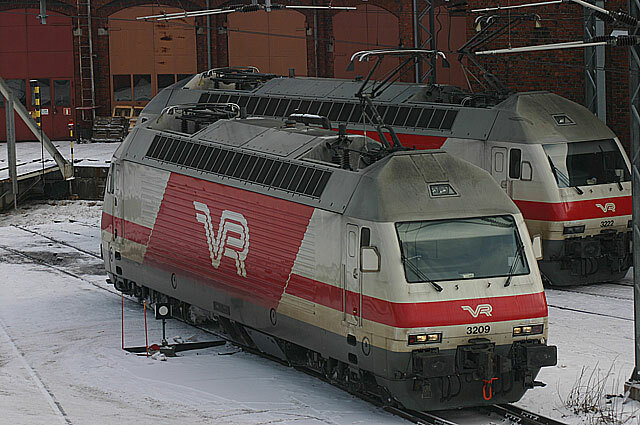 A pair of these was caught near the roundhouse and gives us a view on their roof details. 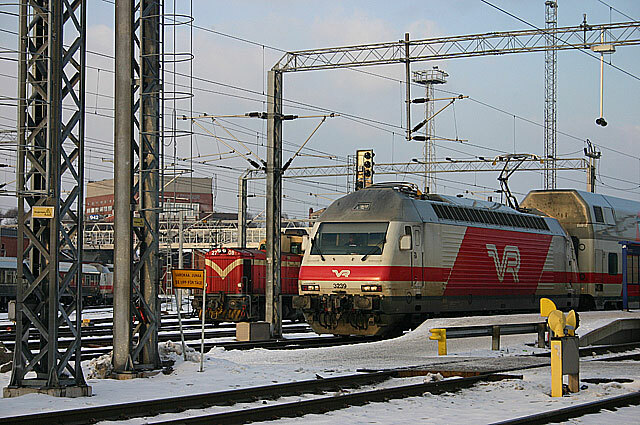 Turku 18th March 2005. 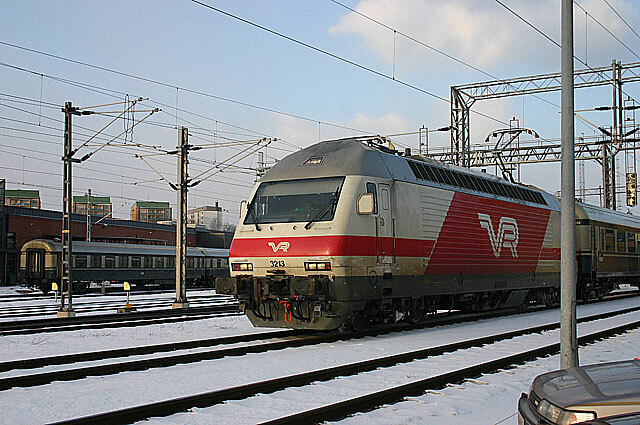 It is a late afternoon and one of the specailities of Turku are the Ferry trains. 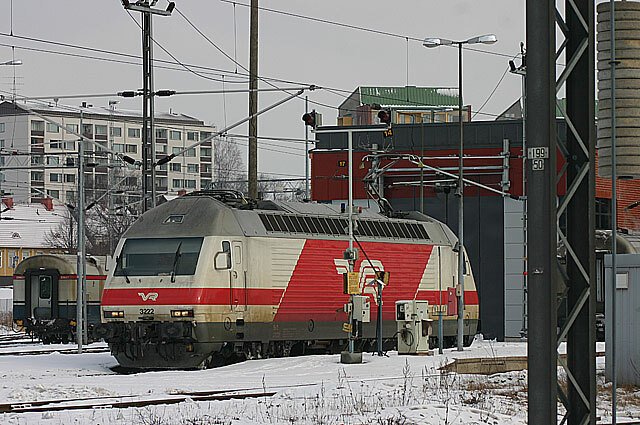 Turku is the only city in Scandinavia to treat the passangers of Silja Line and Viking Line a chanche to ride the expresstrain to the terminal area in the port. 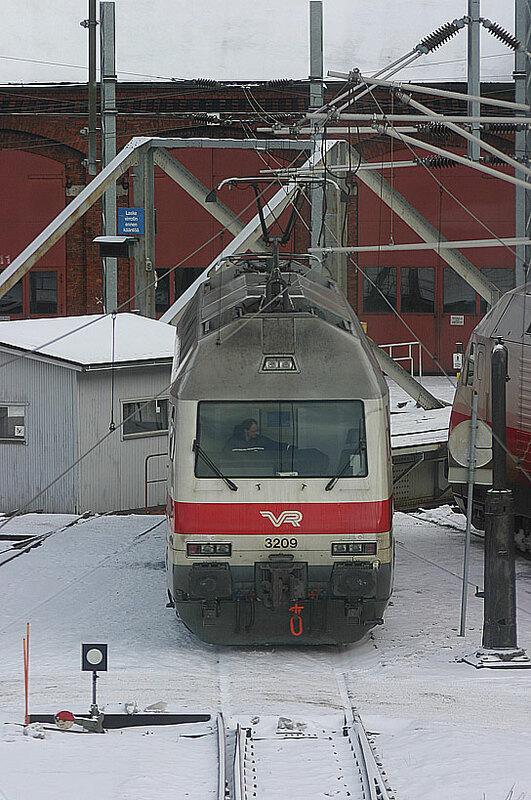 Such is the duty of Sr2 3213 while leaving Turku to cruise in modest speed to the port terminal few kilometers to west. 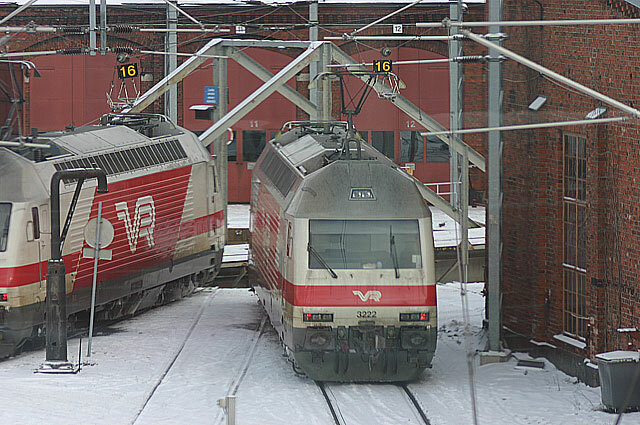 Turku 18th March 2005. 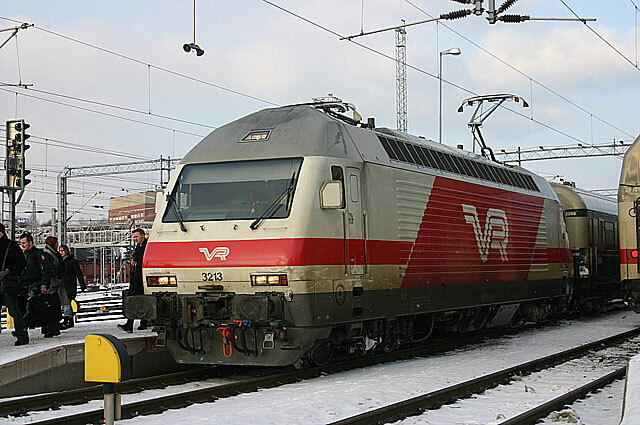 Here a serie of images of Sr2 3222 preparing itself to haul in a few hours an Intercity out of city. 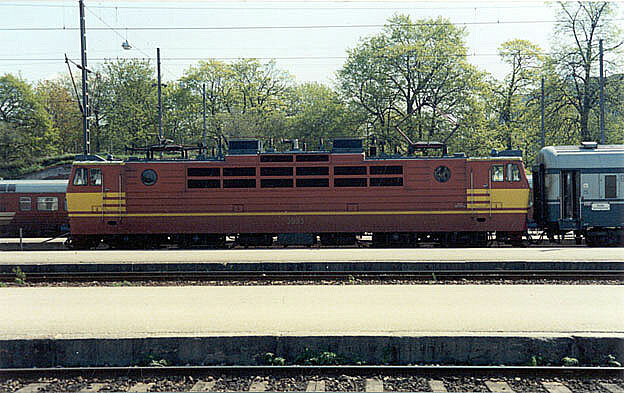 Note that Sr2.s have a different variation of the now standard paint scheme. By the way Sr2.s never wore the earlier schemes and some of The Sr1.s are infact wearing their third schemes. 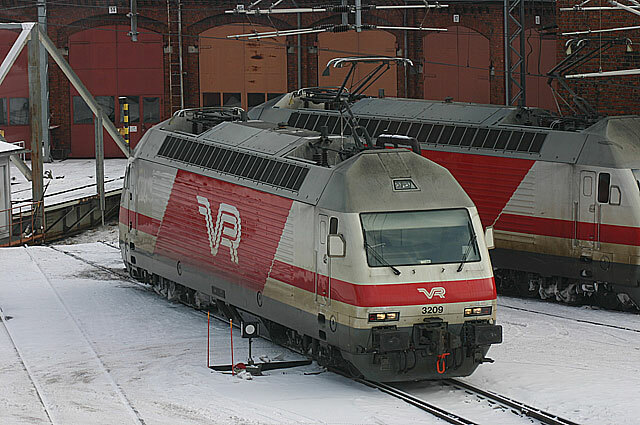 Turku 18th March 2005. 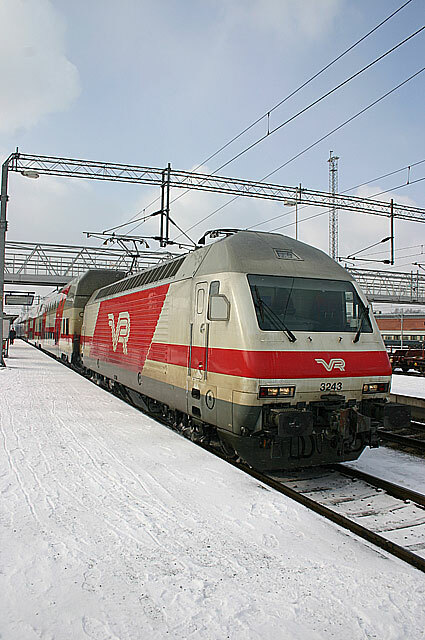 Don't be fooled by the rather small depot of Turku, the train service is busy and on the main station track the former tracks 1a and 1b is now track 7 houses a 6 car double decker IC train to the finnish capitol. 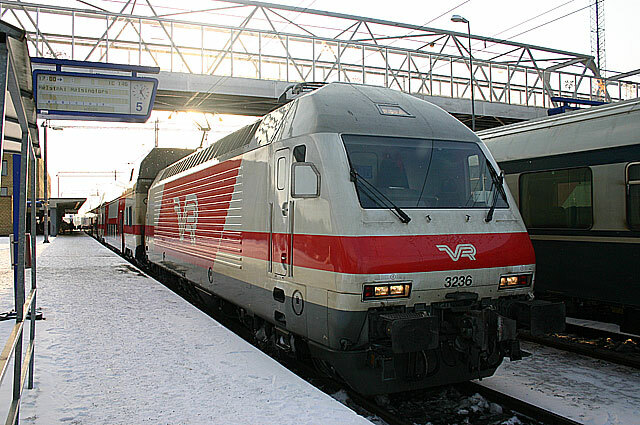 Turku 18th March 2005. 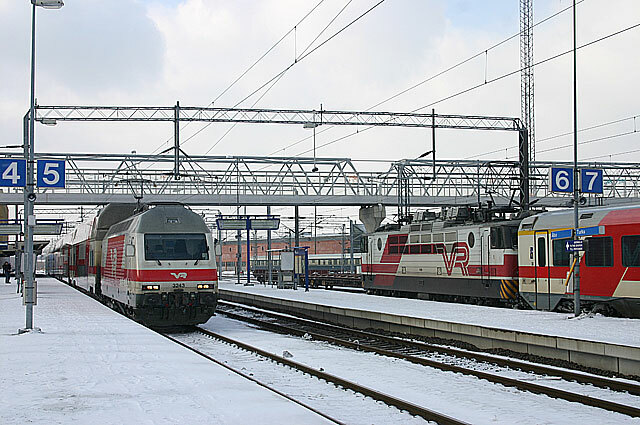 Sr2 3239 had a busy day, as we see it in two different trains first leaving for Helsinki and returning with another ferry train, this time from Tampere! 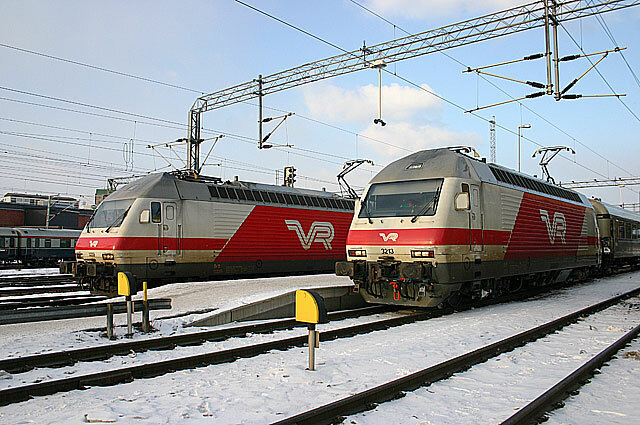 The flagships on VR are the italian Faiat made Pendolino sets that hauls with Sr2 and double deckers most if not all IC services between Turku and Helsinki only stopping t Salo and Karjaa. 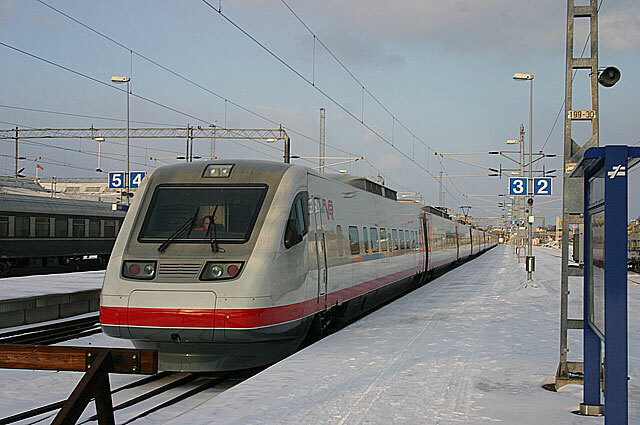 The IC train is sublemented by Fast-trains that consists of first generation steel cars in blue and grey liveries and are all 2.nd class cars and a diner, hauled by the electrics. 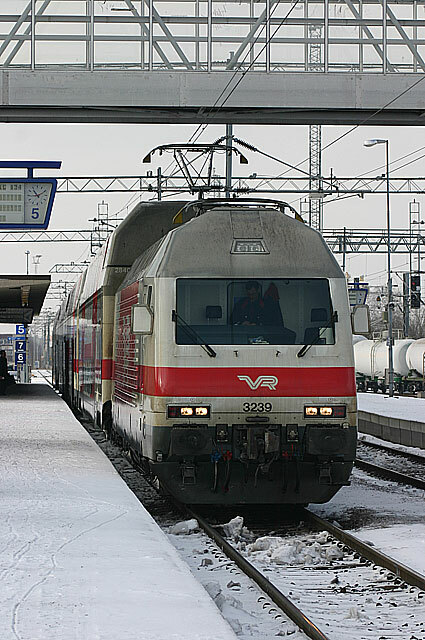 Turku 18th March 2005.